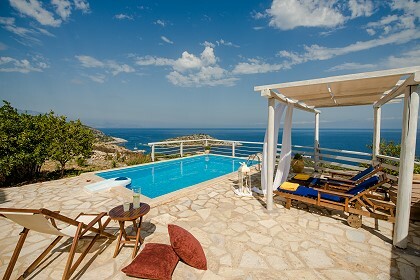 Natura Verde Villas – two wonderful, newly renovated villas with private pools, luxurious amenities and stylish design! 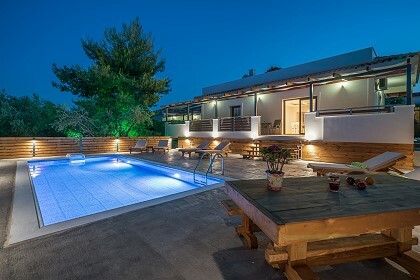 The villas are located in Galaro, a quiet village in the middle of the beautiful Zakynthos Island, and they are surrounded by lush green trees and calmness. 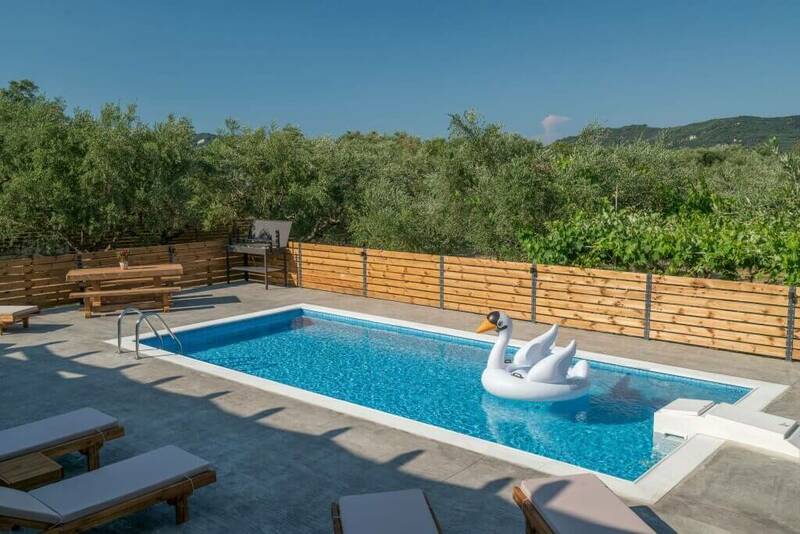 The Natura Verde villas are more than ideal for large groups of friends, extended families and, naturally, big parties, in search of a spacious holiday villa which will accommodate them with ease and will offer them the much-wanted privacy. 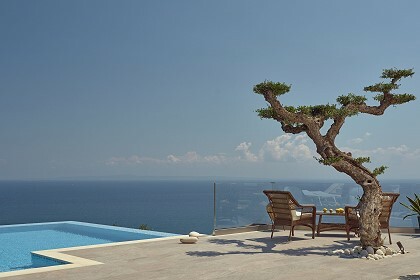 Natura Verde Villas consist of two villas, Chloe Villa and Klelia Villa. 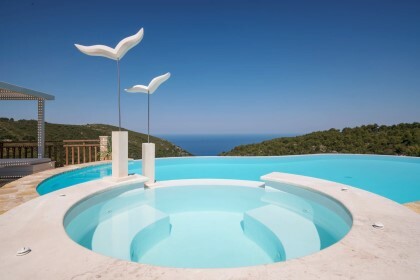 Chloe Villa, which measures 160 square meters, is a 4 bedroom villa with a newly built private pool. 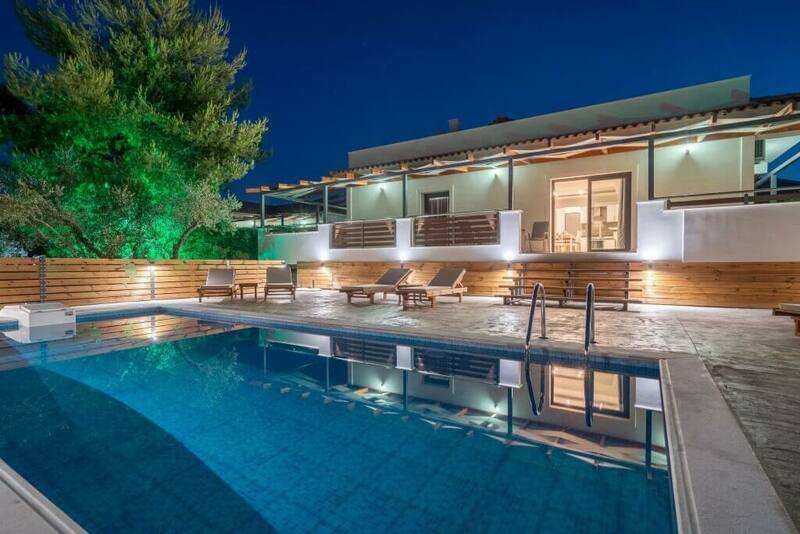 The villa can sleep up to 8+5 guests with ease. 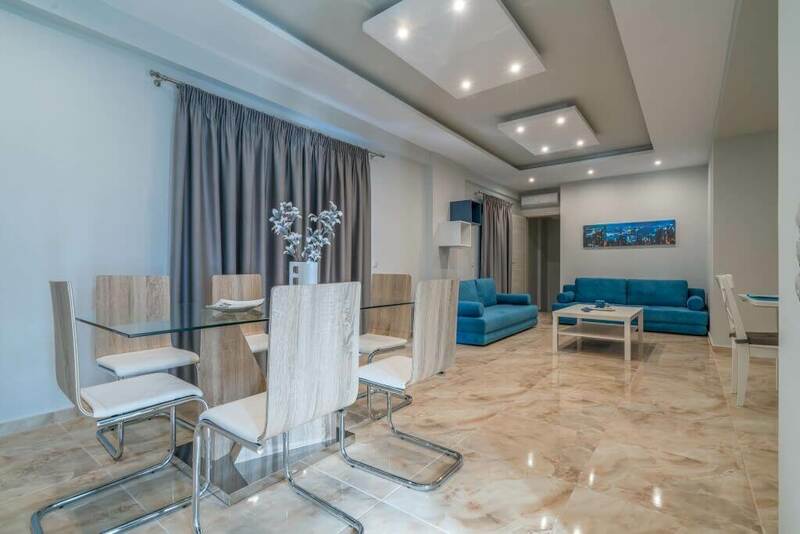 Entering the villa from its main entrance, the guest will find a spacious living room (featuring two 3-seater sofas that can be used as a queen-size bed), combined perfectly with a fully equipped kitchen and a dining area. There is also a master bathroom with a shower. On the ground floor, there are 3 bedrooms in total, a master bedroom with a queen-sized bed and an en-suite bathroom with a shower, a bedroom with two single beds (that can be combined into a king-sized bed) and a sofa bed, and the third bedroom with two single beds that can be combined into a king-sized bed. The lower floor features an additional bedroom with a queen-sized bed and a three seater sofa, which can be converted easily into a double bed. Of course, the furnished veranda has a view of the swimming pool and the garden, while it also offers a direct access to the pool. 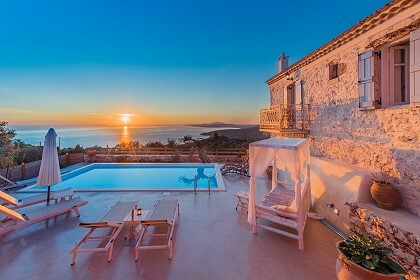 Klelia Villa, which measures 45 square meters in total, is a cozy two bedroom-villa, suitable for 4 guests. The main entrance leads to the fully equipped kitchen and dining area. The house features two bedrooms, one with queen-sized bed, and one more with two single beds that can be combined into one king-sized bed as well as a bathroom with bathtub. The furnished veranda has a view of the swimming pool and the garden, while it also offers a direct access to the pool. Natura Verde villas are located in Galaro, a peaceful village in the center of the Island, where you can enjoy the sounds of nature within lush surroundings. It is located near the popular tourist resorts Tsilivi and Alykes, where you can find anything a traveler would need! 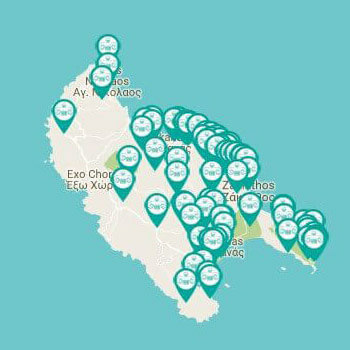 Additionally, being in the center of the island means that you can visit all sides of it, without having to make trips that last for hours.